Chicago Art Deco Society - Pickwick Theater Classic Film Showing of the Jazz Age Comedy "WHY BE GOOD?" 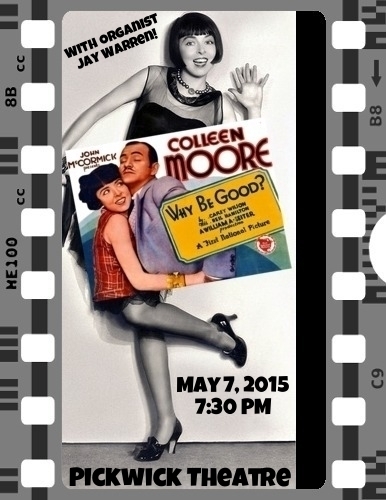 Pickwick Theater Classic Film Showing of the Jazz Age Comedy "WHY BE GOOD?" Silent star Colleen Moore opened the Pickwick Theatre in 1928 with a showing of Lilac Time, but now she’s back to close out our second season of the Pickwick Theatre Classic Film Series. Why Be Good? (1929) played last October at the Chicago International Film Festival, and now this wonderful Jazz Age comedy comes to the suburbs! Alice Hargrave, Colleen’s granddaughter, will be our special guest along with other members of Moore’s family. Alice will introduce the film and be available for a Q&A after the feature presentation. For decades, Why Be Good? had been considered a lost film until a recent restoration by the Vitaphone Project preserved it for future generations. Not only is Why Be Good? a great comedy revealing its star at her best, but it’s also a terrific showcase of Art Deco set design. Due to the connection to Screen Deco, we’ve also invited the Chicago Art Deco Society to join us this evening.